Breastfeeding is important and not always an easy task. If a woman became a mother for the first time, she has many questions. Mobile applications will help to find answers to questions and improve breastfeeding. There are many different paid and free applications on the Web that can simplify the process of breastfeeding. But not all of them are useful. Some really can help, while others – at least not harmful. In this article, we share reviews about some of the best ones. Find out which apps are perfect for nursing moms. This is a program “reminder” for mothers of babies. Newborn Baby Timer helps to understand how much time has passed since the baby slept, had breakfast or bathed. The timer allows parents to set a reminder for each action, so as not to miss a feeding or taking medication. The sound of the alarm clock is calm and unobtrusive – a piano melody or lullaby so that the child doesn’t get scared and cry. In addition, the application reproduces several types of “white noise” to help the baby calm down and fall asleep faster (rain, flowing water, ocean). The application is so simple that it can be used even by a grandmother or grandfather looking after a child. 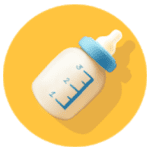 Feature: There is a feeding indicator that shows which breast you fed the baby for the last time. This application is a kind of diary of the baby, which keeps in mind all the actions of the child. It combines Comprehensive Feedings Breastfeeding Logger, Nappy Change Tracker, Sleep Schedule, Growth Tracker, Milestone Logger and Health Logger. Upload a photo of your child and rejoice each time looking at it. Next, we see information about when and what the child ate last time, when the diaper was changed, information about sleep time, development and pumping. The most important advantage of this program is its simplicity. Such programs, in pursuit of rating, overdid it and added a lot of useless functions. As a result, in order to get to the necessary information, you need to perform a lot of unnecessary actions. 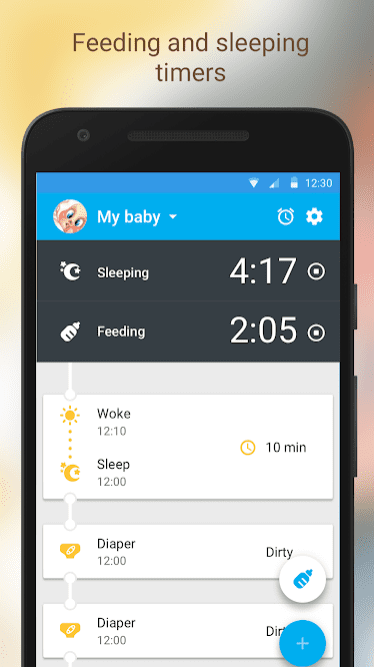 And in Baby Tracker – Feed, Nappy Log, everything you need is on the main screen. Also, you can put a reminder in order not miss the next feeding/changing diapers/sleep. You can track time breastfeed per breast and total for a full nursing session using breastfeed timer. Everything is simple. 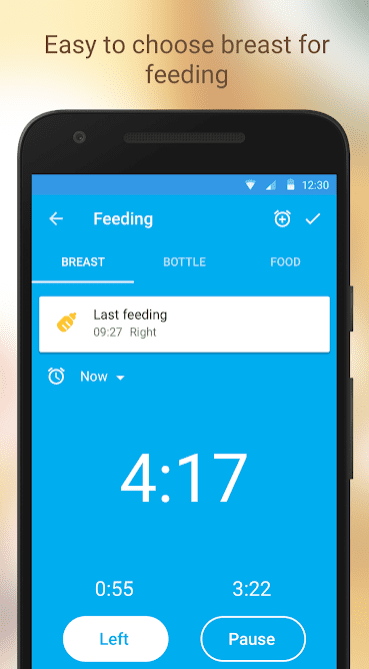 Start and stop breastfeeding timer with one tap. Track pumping totals the same way. If you have several children, then you can keep a diary of several babies at once and compare their development. Data entry takes very little time, but you don’t have to remember a large amount of information anymore. You choose which functions interest and use them. This application will not leave you indifferent. 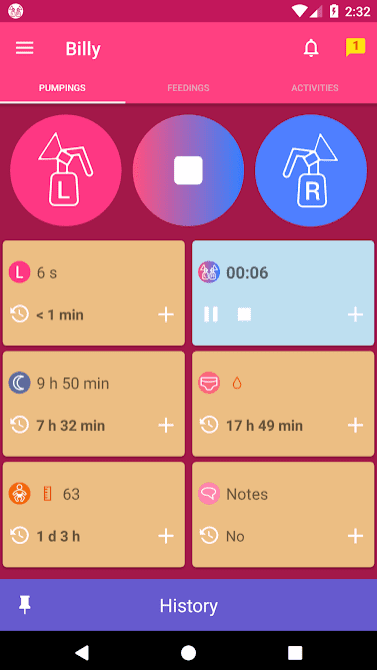 Baby Manager – Baby Tracker & Breastfeeding track is an extremely useful utility for young parents, designed for the Android platform. You can make your everyday life a little easier by downloading the program presented absolutely free. Thanks to some features of the application, parents can keep records of feeding and make a schedule to comply with the regime. The main assistant for parents is the user interface of the application, which is mastered on an intuitive level thanks to thematic images. The wide functionality of the control panel allows you to customize the baby profile individually. Looking for a helpful virtual assistant to care for your baby? 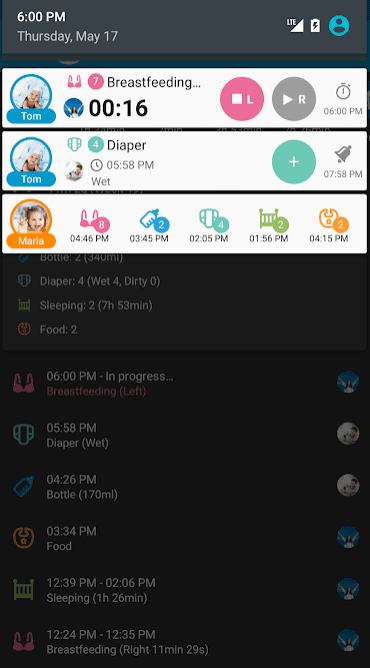 Then download the Baby Manager – Baby Tracker & Breastfeeding track application. How often do young mothers face a complete lack of time and energy to track and control all the procedures required for their child? 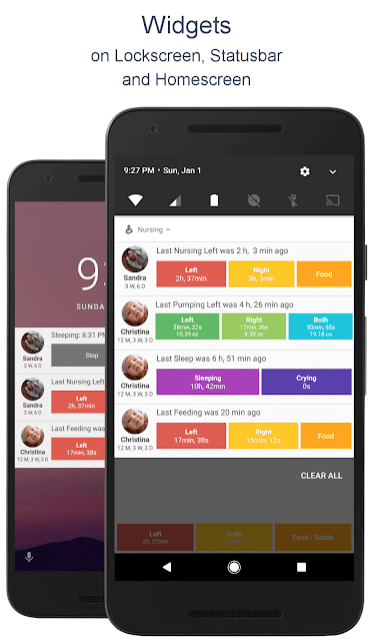 Now you can not worry that you will miss the start of feeding or it will last longer than expected because the Android app Breastfeeding – Baby Tracker has already controlled everything for you. With this app, you can record when the baby is nursed and on which side. 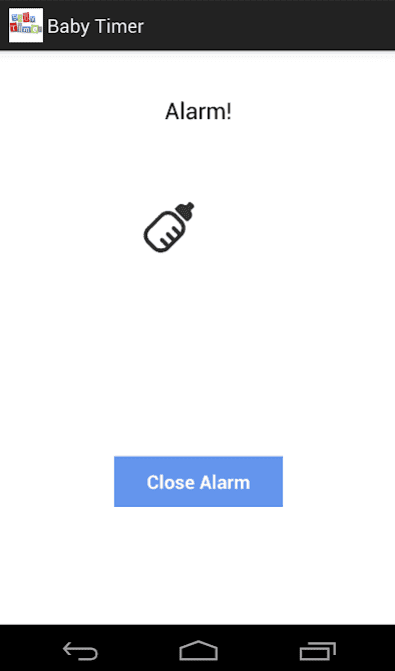 Use widgets, they include start, pause and stop buttons. So, it isn’t even necessary to open the app to make records. Also, you will get a graphical analysis of breastfeeding times. View typical breastfeeding times and know when your child typically get hungry. 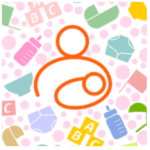 The selection of free and high-quality breastfeeding applications is small. In this program, all the basic functions are available in the free version. Everything you need is there, very convenient navigation. 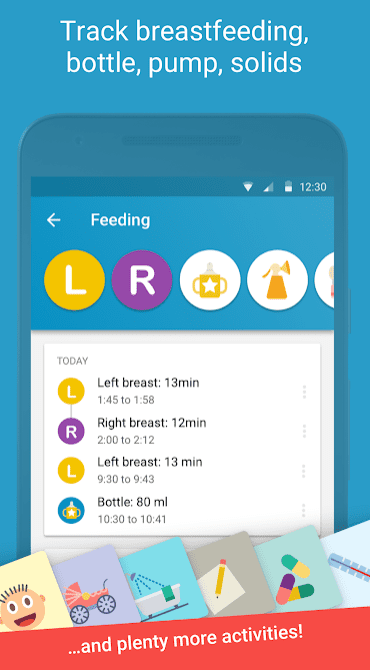 Breastfeeding Tracker for Newborn is a multifunctional application for taking care of your child. It includes such instruments as breastfeeding tracker, sleep and diaper trackers, pumping tracker, height and weight tracker. With it, you can record data on feeding, changing the diaper, sleep mode, and more. 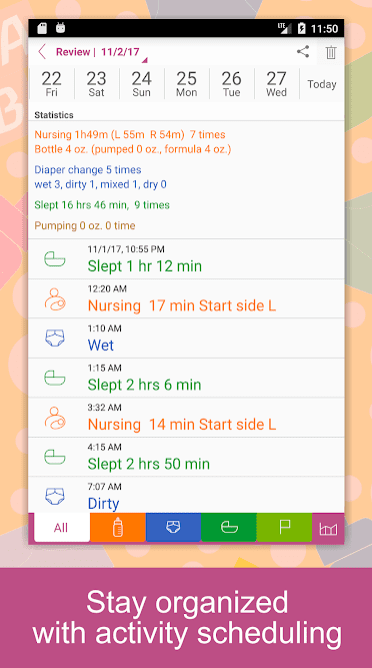 This handy application will help all caring moms track feeding times by each breast as well as bottle feeding. It will become even easier to choose breast for feeding with custom reminders. Starting and stopping a breastfeeding session with just one click! Everything is simple and intuitive! 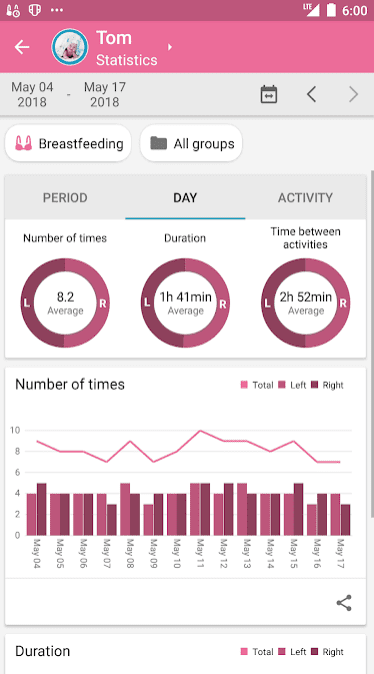 Thousands of happy moms daily use this app to track and record breastfeeding. Join the community! It’s very convenient to keep a feed diary anywhere, anytime. The developers have made the most simple and intuitive application so that mommies are not distracted by a complex interface. It is suitable for all moms: those who feed the baby with breast milk, and for mixed feeding. If you are a happy mother of two or more babies, then the developers took care of you, you can keep a diary of feeds for each child separately in one application. If you are breastfeeding a baby, it is important to offer breasts in turn, so that there is no milk stagnation and the baby receives the maximum benefit from breastfeeding. 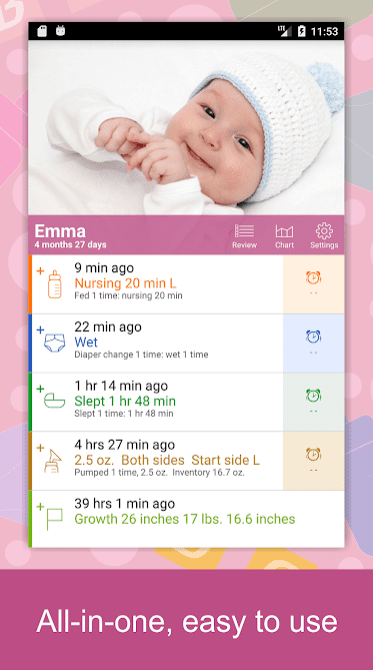 Breastfeeding Newborn tracker application will allow you not to get confused. If you like to keep everything under control, nothing is easier. With the help of this application, you will be aware of what and how much your baby ate, even if you didn’t feed, but for example dad, while you were in the spa. 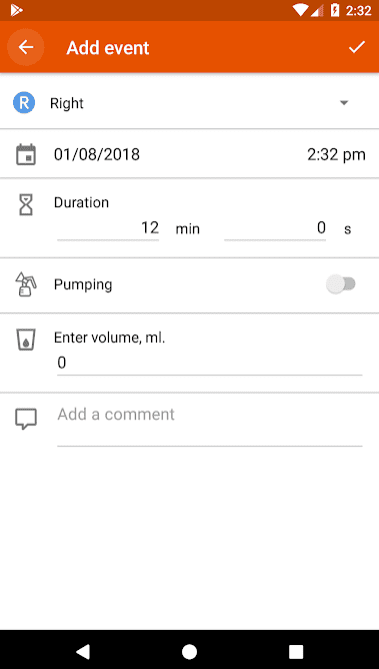 The application allows you to track not only feeding but also pumping. With the help of a convenient widget, all the necessary information will be at hand. The application is cross-platform and available on all mobile devices. Baby Care – Track Baby Growth! – an application for young mothers, which will help to track the development of the baby, quickly solve the questions raised before parents who want to take care of a child correctly. The software will follow the schedule of feeding, baby’s sleep time, tell you important facts about the parameters of baby’s development. You can set the necessary reminders for timely procedures. Make the process of growing up a child memorable – keep a diary, make funny pictures or write down the first words of a child. Don’t forget to share your achievements with your friends or relatives. Use the function of entering information about several babies into the platform. Pick up and set a beautiful widget for each child for quick access from the main screen of the device. Don’t forget to view easy-to-understand statistical tables. Check the schedule of past feedings, supplementary foods or the number of diapers used per day. 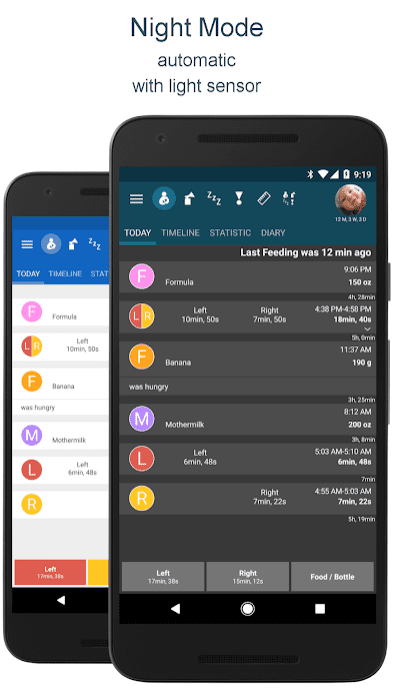 Feed Baby – Baby Tracker is an application for users with Android-based devices who wish to closely track all aspects of the development of their baby. Count the volume and number of feedings, the weight of diapers or the hours of sleep of a child. 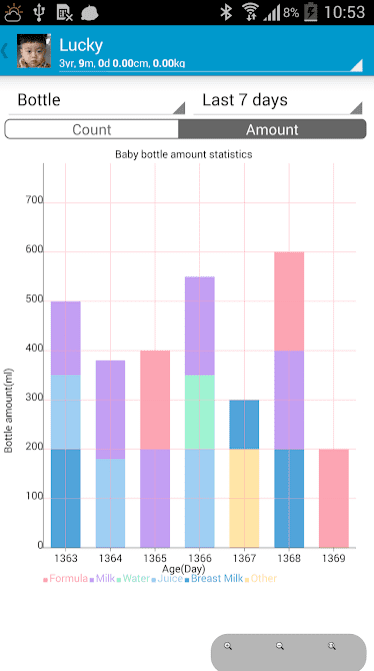 Enter data about your baby and keep the indicators under control. The program was awarded as the best in the Young Parents category by Google Play. Mark past feedings by simply touching the screen with your finger. The application is synchronized on multiple devices, so both parents will see data about their baby. Observe changes in user-friendly tables and charts. Use the screen where the list of all opportunities for a day is displayed or add a widget to the main screen. Choose a theme that you and the baby like – knights, pink, blue – you will find the right one. Effortlessly export your feeding history and share with family or friends. Print the chart and show the doctor if necessary. Use the convenient timer during feeding – you will definitely find out how much time has passed from the beginning. All entered data is securely saved – you can access it at any time. In the “Sessions of feeding” section, you will find information about baby meals. With convenient alerts, you will understand that it is time to feed the baby. In the settings, edit the volumes and portions for food and don’t forget to update the application – you will find awesome new features and handy tips. 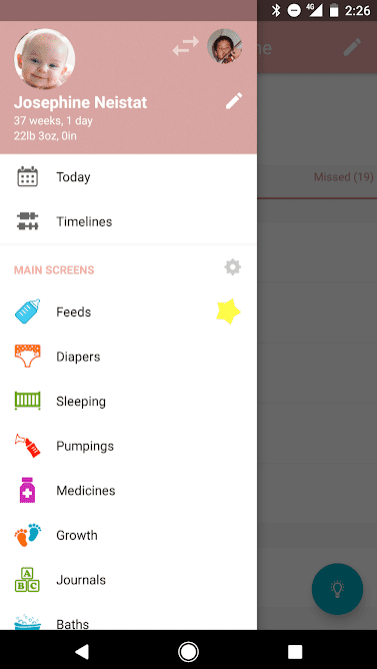 Baby Daybook is a helper application for young mothers. There is a wide functionality that allows you not to forget about all the actions that need to be done for your child for the day: changing diapers, feeding, bathing and sleeping. 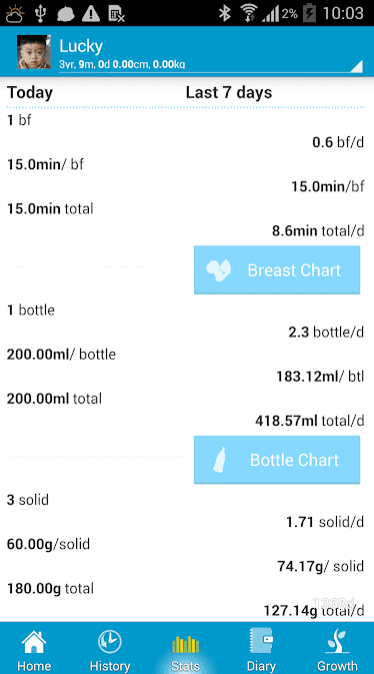 Here, you will track day to day breastfeeding duration, a number of times (total, right, left), milk volume. Set reminders in order not to miss the next feeding. Use night mode. It helps not to distract your newborn during night feeding. There is also a kind of diary, where you can record important points. It should be said that the program will be useless if the mother doesn’t enter data on all types of activity in time, so nothing important can be missed here. 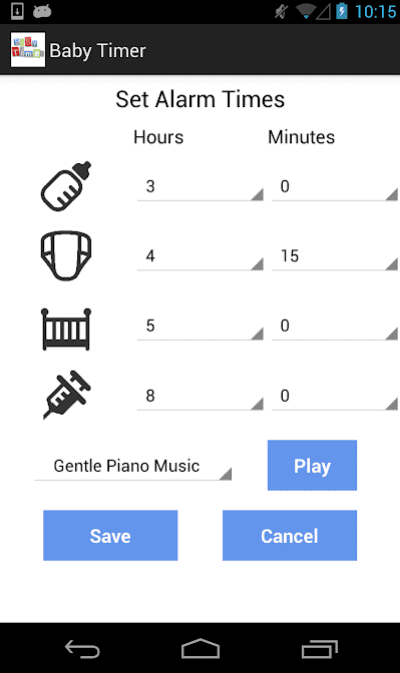 In addition to a variety of useful parameters, the utility has a nice interface, a function of tracking activities for several children and several colorful themes.